Shop for tear stain removers for your cat at VetDepot.com. 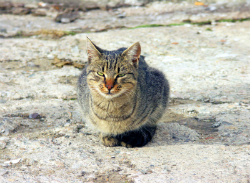 When a cat's tears are exposed to air they turn a reddish-brown color, and if the tears spill onto the fur they can cause unsightly staining, particularly on light-colored animals. These tear stains are not really a health concern, but many owners would just as soon treat them with pet meds. "If you suspect any sort of problem with your cat's eyes, the first thing you should do is make an appointment with your veterinarian." What Causes Tear Stains on Cats? If you suspect any sort of problem with your cat's eyes, the first thing you should do is make an appointment with your veterinarian. Wounds, infections, ulcers, and other serious diseases can cause increased drainage from the eye. Do not overlook the possibility that an underlying problem may be the cause of your cat's tear staining. Once more serious eye problems have been ruled out, owners have several options for dealing with tear stains. Keeping the fur around the eyes trimmed short and washing away the drainage once or twice a day with a warm, wet cloth or eye rinse will keep staining to a minimum. If more dramatic results are desired, oral tear stain supplements are widely available. 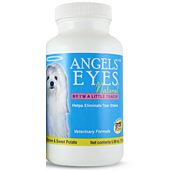 Some of the more popular products like Angels' Eyes contain the active ingredient tylosin, a type of antibiotic. Although the long term use of tylosin appears safe, owners should decide on a case by case basis whether such treatment for tear staining is warranted.